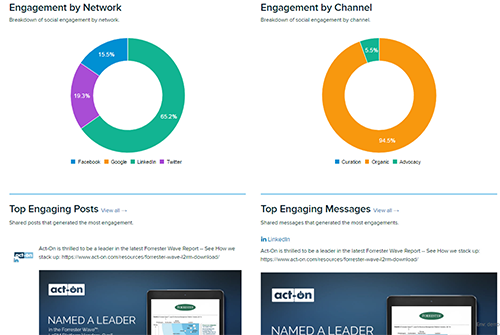 Act-On provides a variety of reports to help you quantify your efforts and show real results. 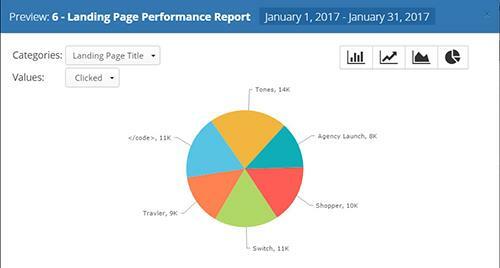 From templates and dashboards to custom reports. Act-On provides reports to help quantify your efforts and show real results. Whether you’re a do-it-all marketer that loves pre-configured templates and dashboards or a data-hungry marketer that likes to slice and dice your data in a BI tool, Act-On has got you covered. Prove the impact that your marketing campaigns are having on your business initiatives. 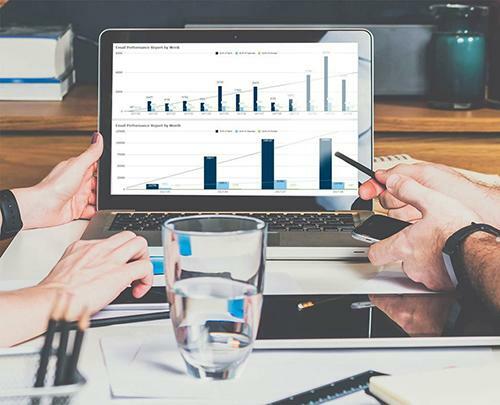 The Revenue Impact report aligns all of your campaigns to leads generated, contribution to sales pipeline, revenue won, and trends over time. 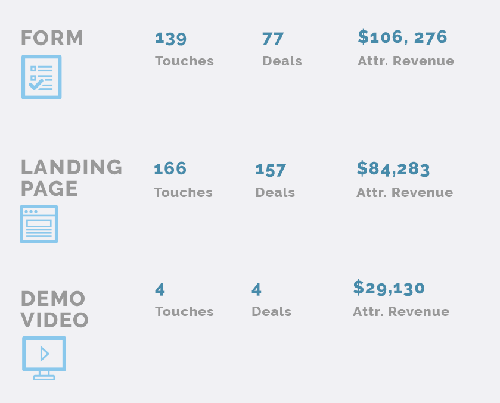 See which assets and marketing touch points have the greatest influence on revenue. 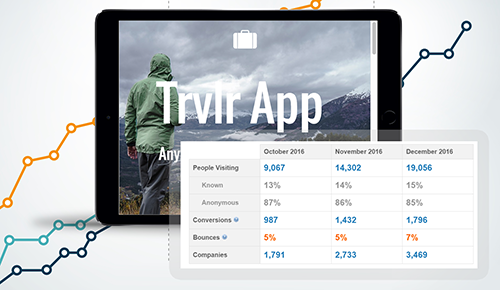 Revenue Attribution Reports use first-touch and multi-touch attribution to correlate your marketing-engagement data in Act-On with closed/won deals in your CRM. 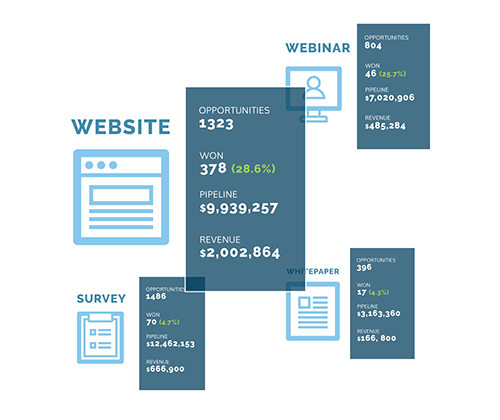 Marketing Funnel Reports empower you with complete visibility into your lead-to-revenue process. 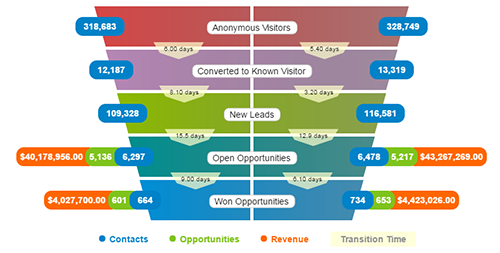 Real-time data snapshots continuously capture the progress of your entire lead and opportunity pool, allowing you to visualize your complete funnel – including potential revenue, achieved revenue, and process bottlenecks. 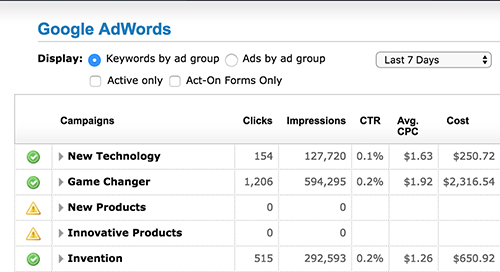 Go beyond impressions, clicks, and submits by integrating Google Adwords and Act-On. 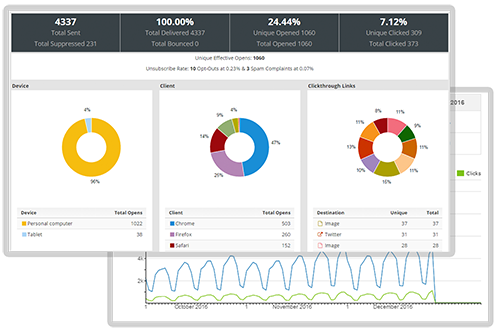 Now you can track campaign performance all the way to converted revenue and see direct ROI. 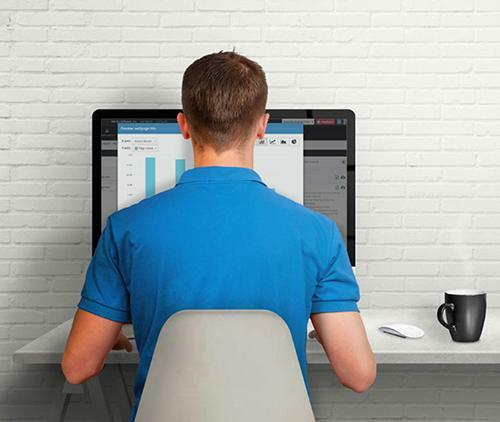 Measure the performance of your email campaigns in real time. From one-off messages and trigger emails to targeted and automated drip campaigns, get big-picture and drill-down views of delivery, bounces, opens, clickthroughs, clickmaps, performance trends, and more! Discover which channels are the most effective in bringing visitors to your pages, and which are converting those visitors to real, tangible leads. The Advanced Social Media Module helps you track your social campaigns and give you insight into what messages are driving action and engagement. You can measure everything from the growth of your followers, peak times of engagement activity, and your best-performing networks for clicks, shares, and likes – all the data you need to analyze your social strategy and optimize over time. 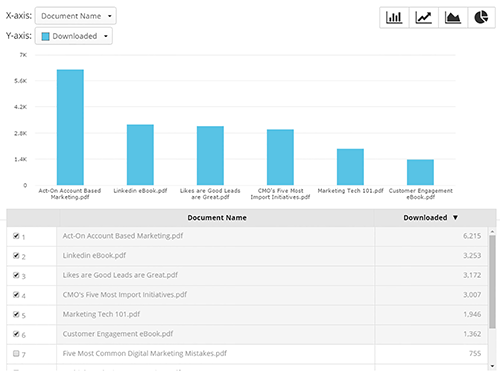 Identify which content pieces are resonating with your specific audience with insights into top downloaded content, and the peak times it’s being downloaded. Act-On’s enterprise feature, Data Studio, makes it easy to view, visualize, and export data so you can use the business intelligence tools you prefer to get valuable marketing insights faster. Everything about Data Studio gives you easy and quick access to all of your data. Engagement Insights is your easy approach to data-driven marketing. With a templated approach using tools you’re already familiar with – Google Sheets and Excel, you can provide real-time insight into how your audience is engaging, to anyone in your organization, without the hard work of manual configuration and customization.